It was no surprise that our first look at Apple’s new iMac G5 was the November 2004 issue’s top letter getter. We received plenty of missives from readers who were just thinking about buying one, as well as a bunch from those who already had. The verdict of the latter? Well, let’s just say that you folks are a tough crowd. Mark St. John My initial impression of the iMac G5 ( “iMac G5,” November 2004 ) is that it could be the affordable, full-power Apple portable for those of us who need to take our computers along for the occasional week at Grandma’s or the beach. Twenty-five pounds is a bit heavy but not that bad. Why endure the expense and limitations of a laptop (assuming, of course, that the iMac could survive being stuck in a suitcase and tossed in the trunk)? Gini McKellar Though the new iMacs are very elegant, they’re also dangerously top-heavy. My two-year-old son pushed the bottom of the monitor in, and it almost toppled on top of him. Good thing my husband was there. If we’re going to keep this machine, we’ll have to strap the bottom to the desk for safety. When we checked out the new iMac, one of the first things we did was give it the tip test. It seemed quite stable to us.—Ed. Catherine Lucas We live in the United Kingdom, but my husband is American, so we bought the new iMac in the States. When it arrived, I plugged it in—and nothing happened. I called the store where we bought it, but they couldn’t help me. So I hit the Net, where my problem was nicely explained. Turns out the power supplies in iMac G5s sold in the United States and Japan don’t have automatic voltage switches. Our old iBook and iMac both work under all voltages. Why shouldn’t newer machines do the same? Apple, get your act together and put auto-voltage switches in every Mac. People do move and want to take their computers along. Ian Beck I really enjoyed your article about low-cost and free utilities ( “Even More Software Bargains,” November 2004 ). You missed a couple that I use every day and that really deserve a mention. A-Dock X (free) is an awesome, expanded Dock, complete with themes and more cool abilities than you can shake a stick at. DeskShade Plus allows you to hide all the clutter on your desktop, play a movie as your desktop picture, and lock your computer while you’re away, and it costs only $7. Stephen Chakwin I liked your write-up of Genius 1.5 ( ). It looked like something potentially very useful to me, so I downloaded it. Only then did I learn that it requires Panther to run. Jaguar, which I still use, won’t do it. It would be helpful if your writers would mention things like this when they write up applications. Warren Potas Annoyingly, Macworld’ s relevance to the mass of Mac users who are still committed to the OS 9.X platform has essentially evaporated. The final straw is your abandonment of identifying Mac OS compatibility in software reviews. Without identifying which software sells to the OS 9.X legacy market, your software coverage becomes irrelevant verbiage to us. I’ve been staring at your renewal notice, trying to find some reason to continue my 12-year subscription. With this final slap at legacy Mac users, you’ve tipped the decision. We decided to drop OS compatibility from the information boxes in our Reviews section because the vast majority of the products we review today work only with OS X. While some products can be coaxed into working with OS 9, many are not officially supported, so we can’t verify OS 9 compatibility. As you rightly point out, Macworld’s focus for the past several years has been on Mac OS X.—Ed. John Hunley It really bugs me that Macworld spends so much time on Microsoft “Bloated” Office and so little time on AppleWorks. I consider myself an above-average Office user, and the only thing I miss using AppleWorks is a few features in the spreadsheet (especially the way it merges cells). I’d like to see Macworld devote more space to AppleWorks. I think if more people used it, they’d never go back to Office—and maybe Apple would put some effort into upgrading it. Matt Kambic, Carnegie Mellon University Robotics Academy Excellent article on Lego MindStorms robots ( Geek Factor, November 2004 ). I wanted to draw your readers’ attention to Carnegie Mellon’s Robotics Academy. We help students and interested “roboticists” of all ages tap into the fun and excitement of learning and playing with robots, in part by creating content for Lego robots. Note that Lego recently announced an OS X version of its easy-to-use Robolab 2.5.4 software.—Ed. David Daigler I’ve got lots of iTunes playlists and have wasted tons of time scanning through them to see if a given song is on one of them. Jim Heid’s trick ( Digital Hub , November 2004 )—control-click on a song name to see which playlists it’s on—is going to save me lots of time. That one tip is more than worth Macworld’ s subscription price. Dorothy Rosa Hunt Shopping for a printer, I first checked Macworld’ s reviews and then moved on to Amazon.com. 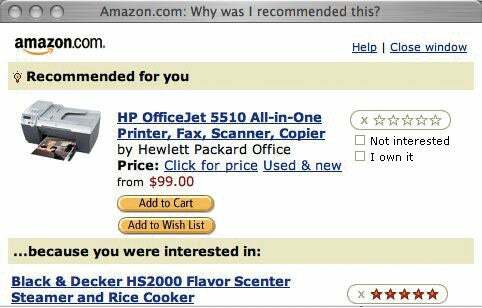 As you can see from the screenshot, the site’s recommendation engine somehow deduced that I should buy the HP OfficeJet 5510. Why? Because I’d once purchased a Black & Decker HS2000 steamer and rice cooker. Chris Trott I had to laugh as I browsed November’s Macworld . If you look at the advertisements for Microsoft Office on pages 32 and 33, the initials of the four apps included in the suite just happen to spell P E W X. Is Microsoft trying to tell us something we don’t already know? Post comments on our forums; send them by mail to Letters, Macworld, 501 Second Street, 5th Floor, San Francisco, CA 94107; or send them by e-mail to letters@macworld.com. Include a return address and daytime phone number. Due to the high volume of mail we receive, we can’t respond personally to each letter. We reserve the right to edit all letters and posts. All published letters and forum comments become the property of Macworld. Also in December’s Hot Stuff, we gave the wrong price for Painter IX. It costs $429 (upgrade, $229). The Webcam 352 (“ Macworld’ s Gear Guide,” December 2004) doesn’t support Macs.